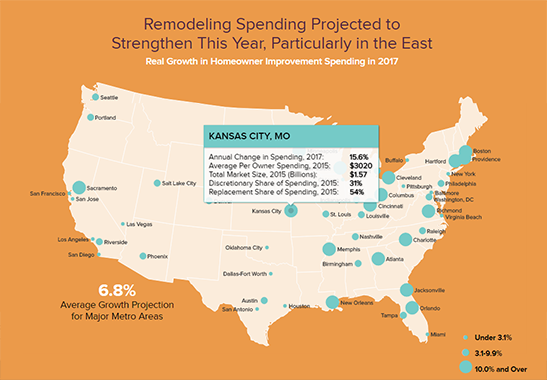 Spending on home improvements is expected to increase this year in 43 of the nation’s 50 largest metropolitan areas, according to our latest report about the home improvement industry, Demographic Change and the Remodeling Outlook. The report projects that, on average, home improvement spending in 2017 in these metro areas will be 6.8 percent higher than it was in 2016, slightly more than the projected 6.1 increase nationwide. However, as an interactive map released in conjunction with the report shows, the growth rates will vary widely. About a third of major metro areas are expected to see strong growth of 10 percent or more, while a similar number should see declines or slow growth of under 3 percent. Some of the largest increases, in percentage terms, are expected to occur in several Midwestern metropolitan areas such as Cincinnati, Cleveland, Columbus, Kansas City, Minneapolis, and Milwaukee, where there is a consistent demand for housing and prices are not as high as in other parts of the country. Double-digit gains in home improvement expenditures are also expected in New England’s three largest metro areas—Boston, Hartford, and Providence—where home sales have been strong. While average per-owner spending in other metropolitan areas on the East Coast has been relatively high in recent years, total spending in several of those areas is expected to increase slowly in the next year. The report projects that spending will grow by less than one percent in New York, the nation’s largest metro area, and by less than four percent in the Washington, DC area. Home improvement spending is also expected to pick up significantly in several fast-growing, Southern metropolitan areas where homebuilding activity has revived and more households are forming, such as Atlanta, Charlotte, Jacksonville, and Orlando. In contrast, spending will grow modestly or may even decline in Southern metro areas with oil-dependent economies such as Dallas, Houston, and Oklahoma City. On the West Coast, the report projects a significant increase in spending on home improvements in the Sacramento metro area, where house prices recovered more slowly from the Great Recession than in other parts of the state. In contrast, spending is expected to increase only modestly or decline slightly in the Los Angeles, San Diego, San Francisco, and San Jose, where leading indicators suggest housing markets may be approaching their cyclical peaks. In metro areas across the Mountain and Pacific Northwest regions, growth rates are also expected to vary widely, from a low of just under 2 percent in the Las Vegas metro to a high of nearly 10 percent in the Salt Lake City area. These projections are based on two measures of housing demand—single-family starts and growth in existing home sales—that are strong leading indicators of national remodeling activity. The results broadly support our expectation that home improvement expenditures in certain high-cost markets may soon reach a cyclical peak, while spending will increase in markets where house prices are lower but are increasing steadily. The report also finds that the national market for home improvements is somewhat more concentrated in the nation’s 15 largest metropolitan areas, which account for about 29 percent of the nation’s homeowners. Illustratively, according to estimates from the 2015 American Housing Survey, average per-owner improvement spending in the same 15 metro areas was $3,500, or more than 30 percent greater than average spending by homeowners outside of these areas. As a result, aggregate spending by homeowners in the same 15 areas totaled over $80 billion, or nearly 37 percent of the total spending by all owners on home improvements nationally.